On Sale Now! 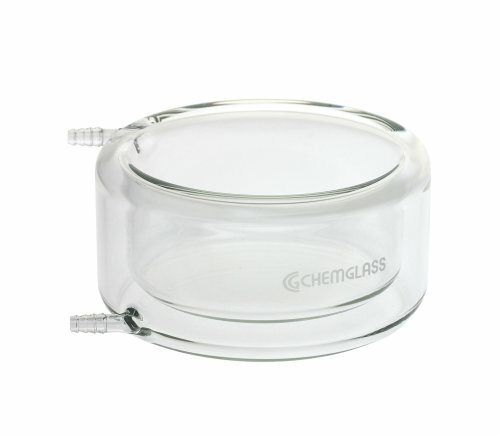 Save 6% on the Chemglass CG-1107-11 Flat Bottom Low Form Jacketed Beaker with Large Opening at the Top of Jacket, 75 mm W x 150 mm H by Chemglass at In The National Interest. MPN: CG-1107-11. Hurry! Limited time offer. Offer valid only while supplies last. Similar to CG-1103, but with a larger opening at the top of the jacket and a shorter overall height. Width to Height ratio on all sizes is 2:1. Similar to CG-1103, but with a larger opening at the top of the jacket and a shorter overall height. Width to Height ratio on all sizes is 2:1. Beakers also have a FLAT Bottom on both the inner and outer vessel. Hose Connections have an O.D. of 10mm at the largest serration.